In the past two decades, Melrose [Minn.] has changed from an overwhelmingly white city with strong German ancestry to a diverse community with a growing Hispanic population. According to the 2010 census data released last month, the city’s Hispanic population more than doubled in the last decade. Hispanics now make up nearly a quarter of the city’s total population of 3,598. The trend mirrors what’s happening on a state and national scale. Hispanics accounted for more than half of the U.S. population increase over the last decade and crossed a new census milestone: 50 million, or one in six Americans. The rapid growth of central Minnesota’s immigrant population, if it continues unabated, has the potential to cause significant social conflict down the road — though less so in the case of Mexican immigrants than for Somalis. The reason the rapid growth of Minnesota’s Mexican population is less likely to generate conflict is that Hispanics present two cross-cutting cleavages: religious and racial. In contrast, there is a large cultural gulf between central Minnesota’s majority-white population and Somali Muslim immigrants from Africa. Cross-cutting cleavages were originally suggested as a mechanism for political stability, as no group can align all of its members along a uniform cleavage-based platform, but rather having to appeal to members of the group that are spread throughout the groups created by other cleavages. In the case of the Somali immigrant community, the cleavages are “reinforcing” — Christian/Muslim and White/Black. One year ago today, I reported that despite an upsurge in threats and violence by far-right radical groups and lone wolves, the Homeland Security Department appeared gun-shy about reporting or monitoring the trend too closely. Domestic security and counterterrorism officials said that even though a controversial report issued a year earlier by Homeland Security about a “resurgence” in far-right radicalization and recruitment appears well informed, if not prescient, the Department had done nothing to re-issue the report or update it. 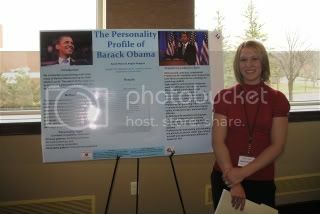 Two years ago today, on April 17, 2009, I featured abstracts of research projects on the personality characteristics and leadership style of Barack Obama, Joe Biden, and Sarah Palin, conducted at the Unit for the Study of Personality in Politics under my direction.